← Spring Has Finally Sprung! Wine Bottled, Corked & Nose Busted Up. REALLY? Hell Hath No Fury Version 2.0 is on the books, yo. But it isn’t without its casualties. OMG…If anyone is more clumsy than I am, please tell me! 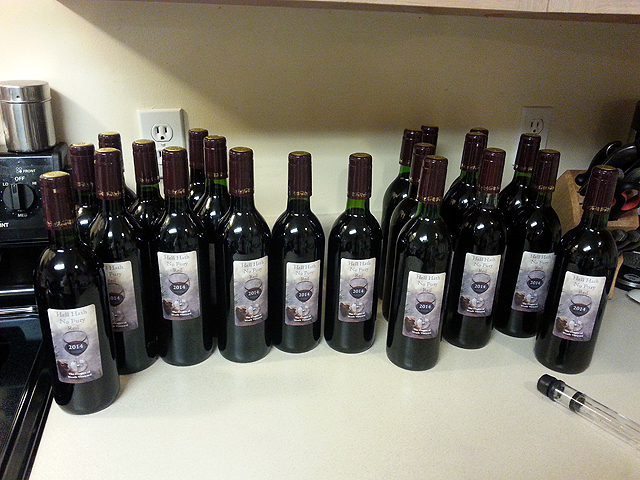 We bottled 21 bottles of wine tonight. I was able to nail 16 of 21 bottles before the corker slipped and hit me in the nose. Like, right square in the damned face. I was good. I only cried for a minute and that was after I saw the blood. And it wasn’t like it was coming from my nostrils. I cut the outside of it when the top of the hand-corker slipped and smacked me right square in the nose. Now, I’ve had my stupid nose broken before, and we won’t go into how that happened, because that would simply piss me off further, but I don’t think it’s broken. So I guess there is that. Please know, for sanitation’s sake, I flew across the room as soon as it happened, in case it did bleed. I saw stars, which is what I saw last time. I was all worried about knocking bottles over, because I am a bit (or more) on the clumsy side. I was uber careful wiping the tops of the bottles off with the cloth soaked in sanitizer, because I didn’t want to knock any bottles over. I brought one bottle over at a time for the same reason. Nobody thought that *I* would be a casualty of my habitual clumsiness. SURPRISE, y’all!. I am hoping against all hope that neither of my eyes will be sporting shiners tomorrow. I mean, I seriously saw stars? Nobody told me a hand corker could be dangerous. What is the most unexpected accident you have ever had? Because, you know, I don’t want to be the ONLY super-clumsy blogger around, k? This entry was posted in DIY, Me being a total idiot and tagged accident prone, clumsy, Smacked my nose. Bookmark the permalink. 7 Responses to Wine Bottled, Corked & Nose Busted Up. REALLY? That’s too bad, Jules. I hope that you don’t get a shiner from that! What unexpected accident have I had? This one is stupid. My sons nerf gun was jammed, so dummy here looked down at the barrel. Have you ever shot yourself in the eye with a nerf gun at point blank range? I did….